ts maximum size is 50 cm. They normally live in small schools and are highly agressive with their prey. They feed on small fish and generally anything in the water that moves and they can trap, and are therefore carnivores. Its reproduction is oviparous and it lays its eggs in the summer (from July to September). 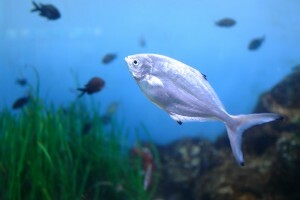 They are fish that appear near the coasts from summer to autumn, although the larger members of the species are further out. It is found in the Mediterranean, the eastern Atlantic from the south of Scandinavia to Senegal, including the Azores. The pompano is a figh of great commercial interest and for sports fishing.